We had a bit of a debate about the article in my local writer’s group on Facebook. Some admired Blacker’s contention that writers should resist pressure from cultural critics, a view I partially agree with (except that then I think about Samuel Richardson, often credited as the first modern novelist in English, who established a reading group of women to help him improve Pamela). But Blacker not only contends that writers should resist criticism from the “cultural establishment,” but that such criticism shouldn’t exist at all. With that, I strongly disagree. “Wow,” I thought, “should I use a pen name?” Since the novel I’m currently shopping focuses not only on women in 18th-century England, but on love between those women, I wondered if I might be subject to the sort of attack he mentioned. It’s something I’ve thought about before. Macklemore took some heat for his “Same Love” song and video. I’ve read discussions on Goodreads in which some claimed that men shouldn’t write lesbian fiction (which mine technically isn’t), although most saw no problem with it. (A bigger problem was men tricking women into reading their fiction by using feminine pseudonyms, and I don’t want to trick anyone.) I’ve asked the readers of my fanfic, The Song of Deirdre, whether they had a problem with it being written by a straight man. Male, female, lesbian, straight, none did (or none spoke up who did). I’ve asked the beta readers of my current novel (straight, gay, and bisexual), and none see a problem with it. To take an example from a different medium, The Legend of Korra, an animated Nickelodeon series by straight creators Michael Dante DiMartino and Bryan Konietzko, concluded with Korra and Asami joining hands and heading off on vacation together, culminating the Korrasami ship that many fans had been calling for. The video below shows how happy some of those fans were with this choice (a big deal for kids’ TV, apparently, but really just a very tiny gesture, which DiMartino and Konietzko admit). 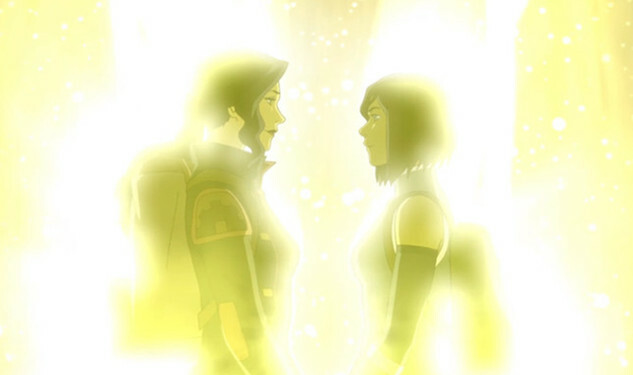 The main backlash to this ending was not from the LGBTQ community accusing the creators of misappropriation (Out magazine’s discussion was very favorable), but from conservatives who felt duped by this “sudden” lurch into social justice warrior land (pretty laughable considering the very first episode of Avatar: The Last Airbender, Korra’s forerunner, announced its feminist viewpoint right away). Or take white authors writing about issues of race. Where was the backlash against Richard Price’s Clockers? Spike Lee made it into a movie. But backlash against Gone with the Wind? Well deserved, I’d say, and that has nothing to do with the author’s race, and everything to do with the book’s rosy view of slavery. Or, to take an example having to do with religion and ethnicity, if you write a love story between a Jewish woman and the commandant of a German concentration camp and end it with the woman converting to Christianity, as Kate Breslin did in For Such a Time, maybe you should expect backlash like this or this. Some have taken this criticism to mean that “Christians can’t write about Jews.” But that’s not what these critics are saying; what they are saying is that if you write something so offensive, you can expect a vigorous response. And well before getting to the beta reader stage, they should learn something about those groups and their struggles, instead of just relying on creativity and imagination. We like to exalt the romantic image of the artist creating alone in a garret, but no one works in a vacuum, free of all the stereotypes and prejudices our society is prone to. There’s even a book about how to avoid many such mistakes, Writing the Other by Nisi Shawl and Cynthia Ward (and online workshops taught by Shawl and K. Tempest Bradford, unfortunately filled to capacity right now). Terence Blacker and some in my writing group would probably say that reading this book or taking this workshop is somehow kowtowing to group-think; others would just call it research. But let’s say I do write a respectful and sensitive novel imagining what bisexual women’s experience might have been in the 18th century (which I hope I’ve done). Aren’t I somehow treading on women’s or LGBTQ territory, especially if the novel achieves any sort of financial success? Maybe so, if it’s a zero-sum game. I hope it’s more like a rising-tide-lifts-all-boats situation, with more viewpoints leading to more interest from readers leading to more sales for all writers in this particular area. But if it is a zero-sum game, then I say, by all means, go read the writers who’ve inspired me, and who can write more authentically about women’s experience: Nicola Griffith, Emma Donoghue, Ellen Kushner, Sarah Waters, and Heather Rose Jones. Of course, I’d be lying if I said I didn’t want you to come back after all that and read my own work, should it ever get published. *At first Shamsie’s call for a man-free year of publishing seemed shocking, even though I had participated in the recent year of reading only women. Encouraging consumers to voluntarily re-balance what they read seems a worthy cause; somehow banning the publication of all work by men seems unfair and totalitarian (and geez, I better get my book out there before 2018!). But first, Shamsie’s call was at least halfway intended as a conversation starter, as a follow-up article pointed out. And second, as Shamsie implied in that follow-up, the best thing about the response to her “provocation” was the “host of interesting suggestions” for different ways to solve the problem. Solidifying battle lines: that’s certainly what happened in the case of the writer I was debating on Facebook (although maybe for him those lines were solidified long ago). And I still don’t believe that straight white men have it worse than women, minorities, or the LGBTQ community in these ideological debates. For every call to not publish men or campaign to give one-star reviews to objectionable material (as happened with Breslin’s For Such a Time), I can cite women writers and commentators threatened, hounded from their jobs, or silenced in other ways (sometimes in very real, lethal ways, as in the movie theater shooting in Lafayette, LA).